I just got back from a full week conference. Don't worry, I'm still partially food blogging while writing my thesis. I finally accepted the offer to do my PhD in Ottawa, Ontario. I found a marvelous place to live with a huge fully equipped kitchen, at least twice as large as my home kitchen. This means more tested recipes with a new group of people. I haven't given much thoughts about how to plan a one-person menu, any suggestions? 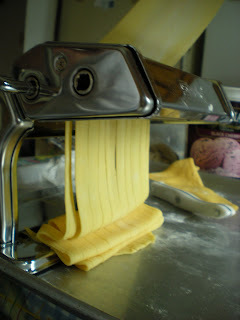 During the conference week, I went to a kitchen equipment store and saw a pasta machine that was on sale for only $20. The cost of such machine is about $70. Before buying a kitchen appliance, I have to get the approval of my parents and strangely, they were strongly in favor in buying one. When I came home, I immediately open some of my favorite cookbooks, start making pasta and cut it into fettuccine. 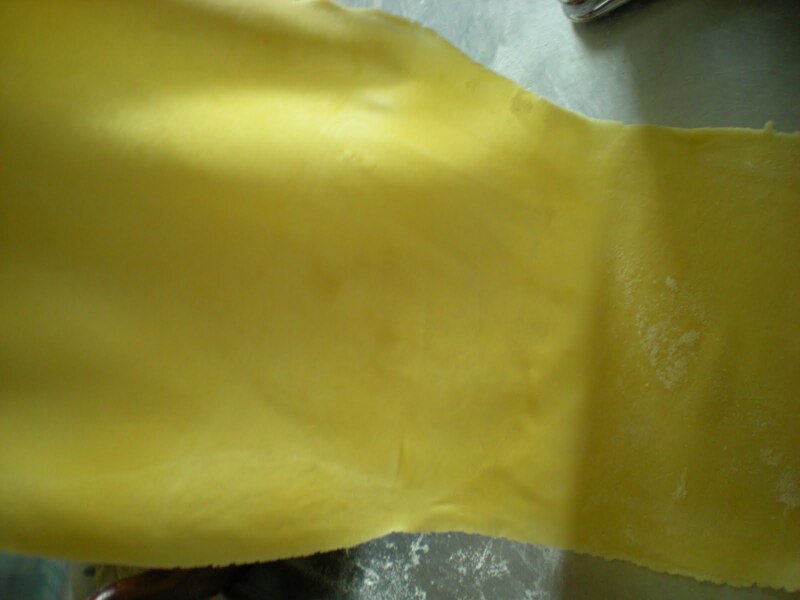 Pasta requires three basic ingredients: egg, flour and salt. My first attempt of making pasta was impressively success. 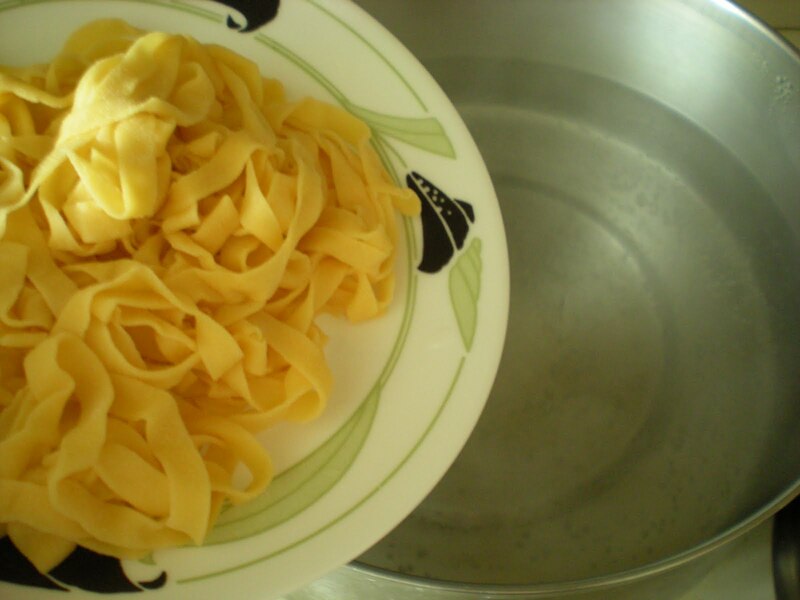 This is the first time that I have ever tasted fresh pasta and it taste very different from the dry ones. No wonder that on this season of Hell's Kitchen, Gordon Ramsay can tell if the pasta is made fresh or not. Fresh ones have a soft and tender texture which absorb the full flavour of sauces. The recipe is adapted from The Cook's Book - Concise Edition. 1. Pour flour onto the surface and form a well, large enough to hold the eggs. 2. With a fork, whisk eggs and slowly incorporate it with flour. Add salt to eggs and continue pulling small amounts of flour until it becomes thick. 3. 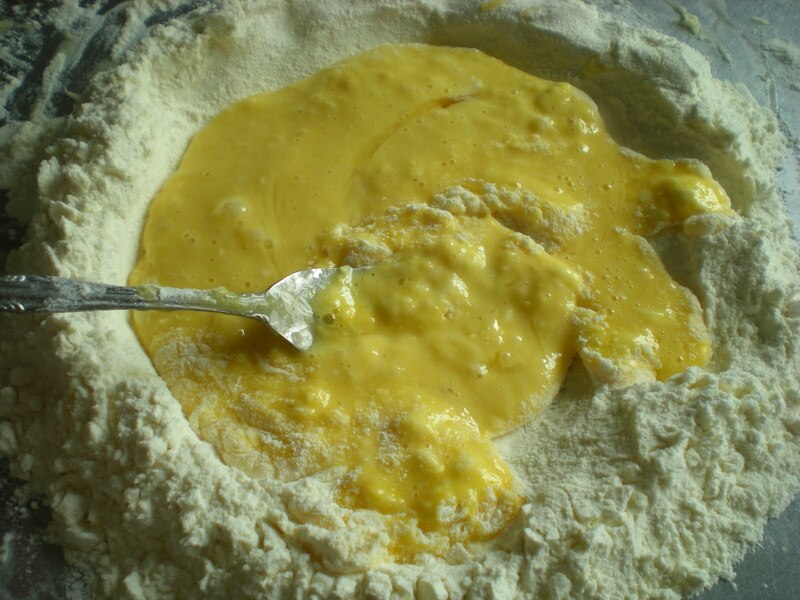 Once thick, start kneading and add the remaining flour until it can no longer absorb the flour. 4. Set dough aside, clean work surface and dry hands. 5. Knead the dough on clean surface until smooth and elastic. Sprinkle a bit of flour if very sticky, but don't let dry. 6. Wrap dough in plastic wrap and refrigerate for about 30 mins. This will help soften the dough, enough to be stretched. 7. Cut dough in half. Flatten the dough and pass it through the widest setting on the pasta machine. 8. Decrease the setting a notch and pass the dough once again. Repeat it once more. 9. Fold the dough into thirds and flatten it. Return to its widest setting and repeat step 7 and 8, 3 more times until the dough fells silky and elastic. 10. 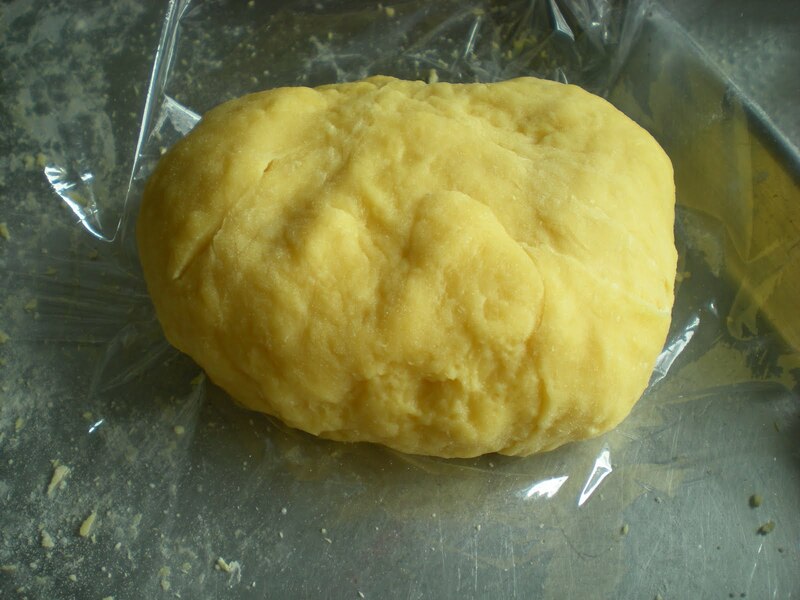 Roll the dough through the machine on decreasing settings until desired thickness is reached. 11. 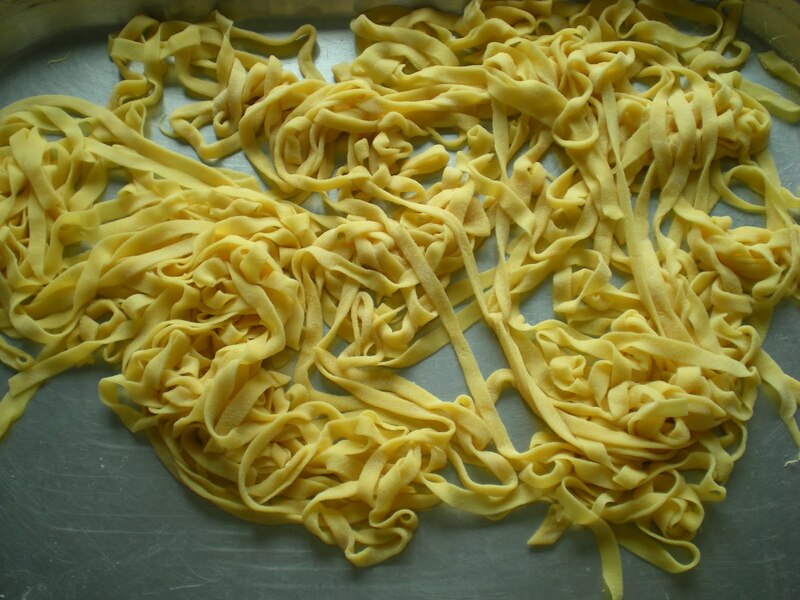 Use cutters to cut pasta into fettuccine or tagliarini. Toss a bit of flour to prevent for sticking after cutting. 12. 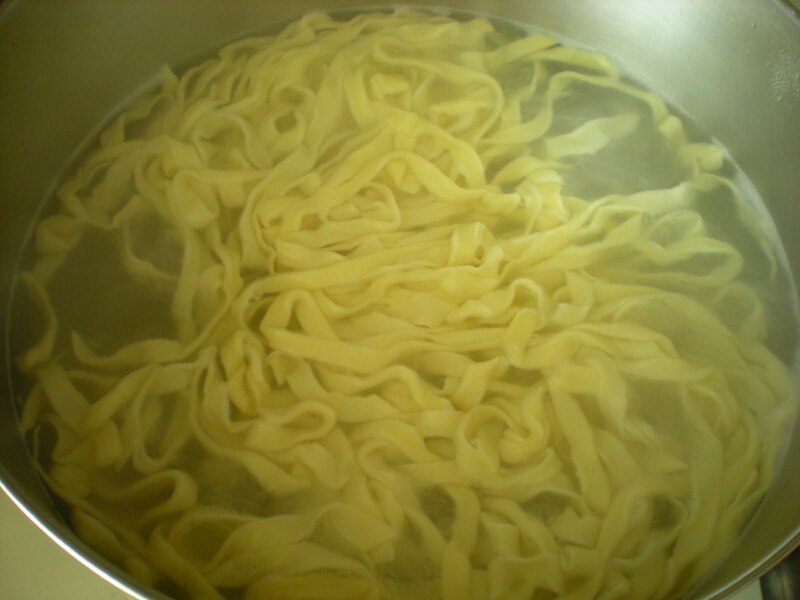 In a large pot, boil water and add salt. 13. Add fresh pasta and cook for about 1 min. It is ready when you can no longer taste the rawness of the dough. 14. Drain and serve with your favorite pasta sauce. The idea of home made Pasta sounds really exciting. Thanks for sharing this recipe. Homemade pasta is a wonderful thing; just wish I could get up the nerve to try it! You make it look very easy! Pam, there is nothing to fear in cooking, I'm pretty sure you will do great in making pasta. I'll be posting some creative pasta sauce soon. wow, i missed the the creation of these little beauties! they look good!